No weather news at this time. 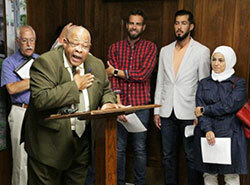 More than 20 members of the greater Evansville faith community gathered in the narthex of the University of Evansville’s Neu Chapel on Aug. 29 to publicly renounce hatred and offer a formal statement to that effect. Why are we called "The Criterion"
The Criterion is Indiana's largest weekly newspaper. It is delivered every week to more than 65,000 households in central and southern Indiana.